Making your car bounce up and down or rocking it in order to get more petrol or gas in is a myth. However, the latest video that surfaced online showed that there are citizens who are either not aware that this theory has been debunked or they are just set in their ways. 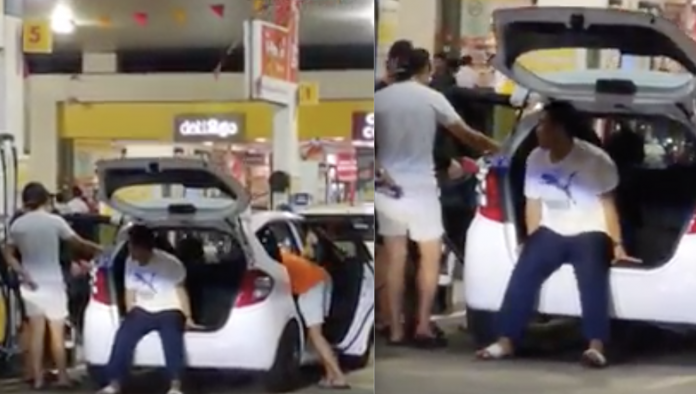 Recently a video surfaced on World of Buzz, showing four men, reported to be Singaporeans bouncing their car up and down car in an effort to fill up more petrol at a gas station in Johor Baru. The video was uploaded in All Singapore Stuff’s Facebook page on April 7 and has since garnered over 108,000 views. The caption reads, “This weekend, spend quality time with your family”. It was a team effort to try and get more gas out of the trip, with one man in a white t-shirt sitting at the open boot of the car using his full weight to bounce the vehicle up and down. Another man in an orange t-shirt had the task of vigorously shaking the car from the passenger seat. Their remaining teammates were in charge of monitoring the petrol pump while the car shook. The video then zoomed out to the station and showed a queue of vehicles waiting for their turn with some laughter being heard in the background before focusing back to the four men, the one in white still busy bobbing up and down. This scenario is not new at petrol stations. A YouTube video uploaded by happiesdog showed the same effort. “It happen at Esso Taman Pelangi, the Singapore vehicle trying to pump as many (sic) petrol as possible hence they trying to ‘shake’ (sic) the car while pumping the petrol (sic),” said the caption. The theory is that when we shake our vehicle’s gas tank while pumping petrol, it will dissipate the foam and vapour that naturally occurs. However, the theory has been debunked and categorised as a myth because there is no way to make the vapour dissolve faster except by waiting. In another article by Says News, motoring experts have pointed out that fuel tanks were not created to be filled to the brim because the extra space serves as a safety feature when fuel expands. When a gas tank is 100% full, inflammable vapour could leak which releases harmful vapour into the air as well as posing a fire risk. Overfilling can also ruin the car’s engine which is more expensive to repair compared to saving a few dollars on petrol. Meanwhile, netizens commented on how the cost of repairing the car’s suspension or tyres would probably be a wake-up call to the passengers.